Discussion in 'Non-Indian Domains' started by Prashant Sharan, Apr 15, 2019. Let's look at the market's performance on 14th April, 2019. GoDaddy had six of the top ten sales yesterday led by 03366.com which sold for $12,250. NameBio recorded 276 sales $100+ for a total of $138,262 with an average sale price of $501. Compared to the previous day there was a decrease of 16% in the number of sales and the total dollar amount also decreased by 16%. We also recorded an additional 1,180 sales below $100 for a total of $28,552. The domain Stud.net sold for $1,041 at GoDaddy for a decrease of 65%. It last sold for $3,000 on May 6th, 2011 at Sedo. 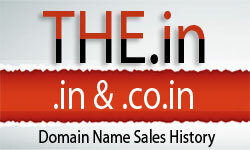 The domain BigBid.com sold for $432 at NameJet for a decrease of 78%. It last sold for $2,000 on January 6th, 2011 at Sedo. The domain SafeShopping.com sold for $1,000 at NameJet for a decrease of 80%. It last sold for $5,000 on January 19th, 2011 at Sedo. The domain Sokker.de sold for $113 at Sedo for a decrease of 93%. It last sold for $1,692 on December 23rd, 2008 at Sedo.